This term my students have been working on a Geography Theme around their local area, that lead as an aside to a number of post on using Quikmaps. My curiosity about how to tag images in this environment emerged from work I was doing with the class anyway, using digital images to map our locality, firstly on paper and alongside this using 2 create by 2 simple to develop a simple zoomable atlas. The final map they needed for the project, showing the school and our environs was a Quickmap, that I developed for and with them, showing the route of a walk we took around school, to which I tagged, photographs taken by the students on their walk, for display on the school website, and use in a small video project about our favourite places. With these images stored, the students used 2 create to make an initial 6 slide show, and on each slide they placed the the maps in "zoom order." The next stage was to use buttons to locate the zoom point for the map, a button being placed on Our home continent, The UK, England, Bristol and so on. Right clicking on the buttons, actions were added that hyperlinked each location to the map associated with it, so clicking on the Europe button would take us to a slide with a map of Europe on it, Clicking the UK button there would take us to a map of the UK and so on, until we eventually arrived in Bristol. On the Bristol map a button was added to take us to another slide yet to be created where the aerial photo developed in Quikmaps would be located. Getting the aerial photo we had made in Quikmaps was achieved by making a screen print. 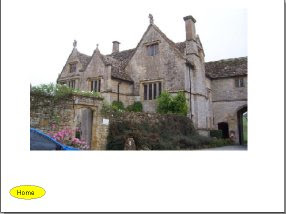 With the Quikmap in the web browser window, the print screen key was pressed, then in a graphics package, this image was pasted and cropped, before being saved to a shared folder for the students to use in their projects. For the next stage of the project all of the photographs taken by the students on our walk, and during subsequent activities about our favourite places in school were copied to a shared folder alongside the quikmap as a shared resource for the remainder of the project. The students then inserted the quikmap image to their 6th slide. In their groups they decided which of the images they would like to use in their project and added additional slides to accommodate them. With the Quikmap inserted, and their chosen photographs added to the additional slides, they then set about linking each photograph to its location, inserting multiple buttons to the quikmap, using place holder pins as reference points that enabled them to think about where each location was in relation to the others. On the photoslides adding backlinks the map enabled the document to become a kind of virtual tour too, as the reader is directed to return to look at other locations they have photographed. The whole process has been incredibly exciting. The use of talk throughout, has facilitated through discussion the use of subject specific vocabulary in context, we have used maps to begin engaging with the scalability of the world from landmass and ocean, to continent, country city or town and region. Within our locality we have used maps to find and estimate position of place in relation to others, as well as to help observe features of our place in space. 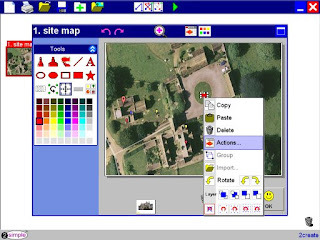 As an active mapping project the children have not only experienced a diverse and challenging set of ICT skills, but they have used these practically to consolidate geographical concepts moving from a global position to hands on mapping of their own locality. I will hope to share some of these projects, by exporting the projects to Flash, and embedding these for exploration on the school website soon, alongside the video project which is emerging using photographs to talk about our favourite places. FlickrStorm: How Would You Use the Image Returns?